Azure Functions is a new service available in Microsoft Azure to help developers run code on serverless architectures. In essence, Azure Functions is about events and code - developers write some code that will be executed upon some triggering event - but what sets Azure Functions apart is its simplicity. Developers can write just the code they need, without having to configure any supporting infrastructure. 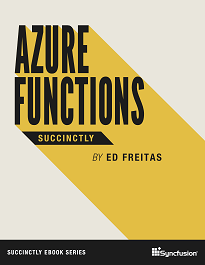 In Azure Functions Succinctly by Ed Freitas, you'll learn the basic applications of Azure Functions, how to create your first Azure function app, and how to work with different triggering events.